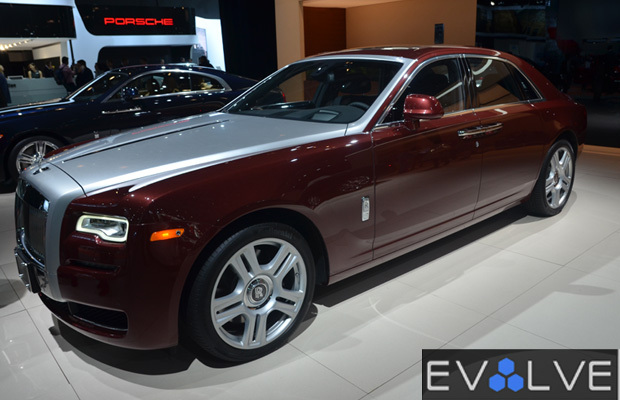 A refreshing take on its most popular luxury saloon, Rolls-Royce welcomed its latest entry-level option to the 2014 NY Auto Show: the Ghost Series II. Carrying over the same iconic frame from the series, while implementing subtle, yet refreshing design facets—both inside and out—the stately sedan introduces new tweaks from the “wake channel” running bonnet to its two-toned paint scheme. Simply put, the Ghost II is the personification of high-end performance and premium style. Sitting beautifully in the middle of the Jacob Javits Center, the automaker welcomed us into their private booth, where president of Rolls-Royce Motor Cars North America, Eric Shepherd, jumped in the driver seat to provide us a special look at the Ghost Series II. Here’s a glimpse at what $280,000 will get you.